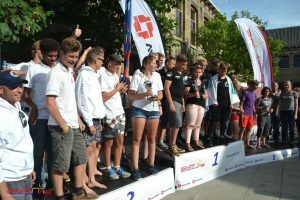 Three weeks of hard work during the Solar Sport One races has come to an end. 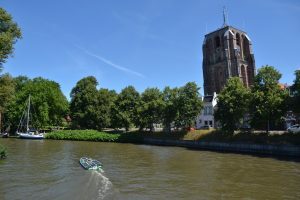 Thanks for your endless dedication, hard work, innovative ideas to push this solarboat event in The Netherlands. Some of the teams are going home. Some of you are driving to Monaco this week to compete in the last event of the world championship. Good luck to you in Monaco and good luck to the teams who are going to improve their boats for our races in 2019! 8 days of racing are behind us. 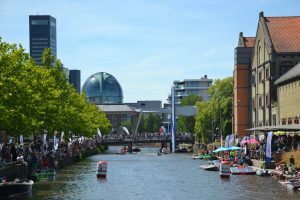 More than 300 km over water, Top Speeds over 45 km/h, around 50 boats during the canal parade in Leeuwarden. 7 daily videos, around 400 photos, good social media reach. Without the 74 crew members, daily safety boats, catering, logistics, the app and online tracking we wouldn’t have an event like this. We are going to evaluate and improve for next year. Find here the overall ranking. Results. 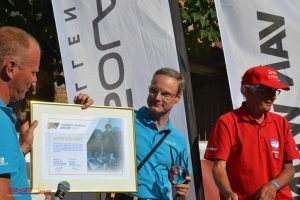 The Wubbo Ockels award was created to honor special people from the solar boats industry for their work. Winner of 2016 Kees Zwaan (Team Sunflare) handed over the specially designed goblet to Joris Melkert in the inner garden of the Blokhuispoort. Joris, lecturer at TU Delft, is the driving force behind the technical part of Solar Sport nationally and internationally. He has been chairman of the technical committee from the beginning and is responsible for the regulations. This always in an accurate way with a lot of love for innovation and the sport.